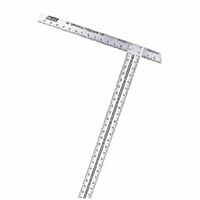 Wallboard Drywall T-Square, 18 X 47-7/8 in, Aluminum, Anodized Specifically designed for the drywall professional. Large, bold numbers and graduations. Patented rivet design. Permanently fixed joint of blade and head. Anodized aluminum finish. Unique rivet assembly, permanently bonds head to blade. Head will stay square for life of product. Extruded aluminum 3/16" thick blade and head. Clear protective anodized finish will not rust or corrode. Screened thermal bonded black 1/8" graduations. Large bold graduations and numbers for readability.